Thursday | September 7, 2017	Longing for a softer, fluffier and bigger cheese tart? 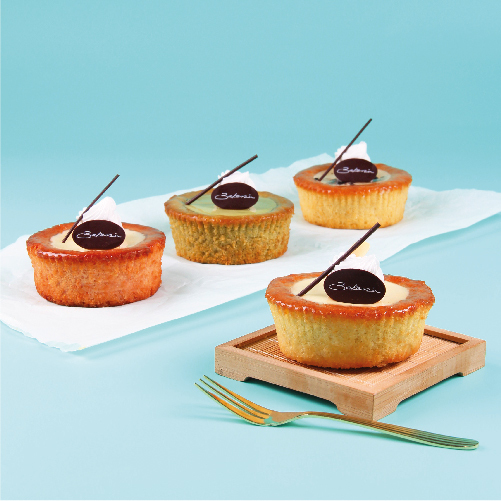 Bakerzin introduces its own interpretation of cheese tart, rich and creamy to satisfy your cheese tart cravings! Available in four different masterful flavours, you will be spoilt for choice! Original Cheese Tart A traditional cheesy addiction filled with rich and creamy cheese up to its pinnacle. Overlayed with a shiny coat of apricot glazed honey, the almond sponge is sure to satisfy your cheesy craves. Matcha Cheese Tart A must try for Matcha lovers! Matcha Sponge filled with matcha mousse and coated with a shiny layer of apricot glazed honey. This shall be the one to tempt your taste buds! Strawberry Panna Cotta Cheese Tart Italian fusion strawberry panna cotta cheese tart with crazy creamy and distinctive strawberry flavour. Topped with a shiny coat of apricot glazed honey, the strawberry feuilletine-filled filling is out to capture your sweet tooth. Oreo Cheese Tart Soft and fluffy Oreo chiffon baked with a mix of cream cheese and almond sponge. Glazed with apricot honey, the Oreo cheese tart will make you come back for more! **Exclusive promotion, savour all four cheese tarts for the price of three! Get them at any Bakerzin outlet from 7 September onwards at SGD4.50 per piece!